Katrina ~ Time for Lots of Love and how can there be more love than a Mammoth Love! hee hee I chose to go with this adorable digi, Mammoth Friends, from Sticks & Bones to create a fun Pre-Historic Valentine! there is so much in this kit I really didn't know when to stop! Cindy - All you need is love.... For this challenge I have used the love and kisses digi, which I have colored with copics. 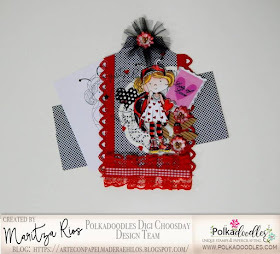 The paper I have used is from the Lily love bug paper heaven 2 bundle. I just love these colors! Sentiment - Love/Romance Love & Kisses sentiment tags - download printable digital stamp on details on my blog . Please email us HERE quoting DCW191001 to claim your prize of 3 digi images from the digi store! Hi, I am Nisha. Thank you for choosing me as the winner of the chllenge "week 1 ". I mailed you several times but unfortunately the mail didn't get delivered. Instead, it shows as some server error. That's why I am posting this message in your blog. The code given to receive the prize is DCW191001. Thank you once again. Whaouuuu!! Only beautiful cards! You are a great Team!